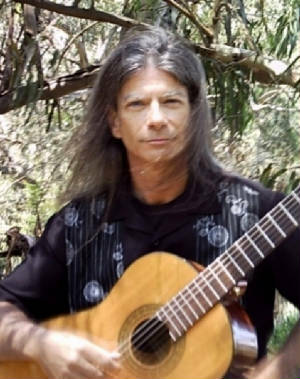 Classical guitarist, Eric Hamilton enjoys a multifaceted career as solo and ensemble performer, accompanist, recording artist, musical arranger, teacher, and as an A-level industry certified stringed instrument technician. It is the intention of this website to present a detailed page dedicated to each of these areas. To select other pages on this site, use the navigation bar at the top of the page. 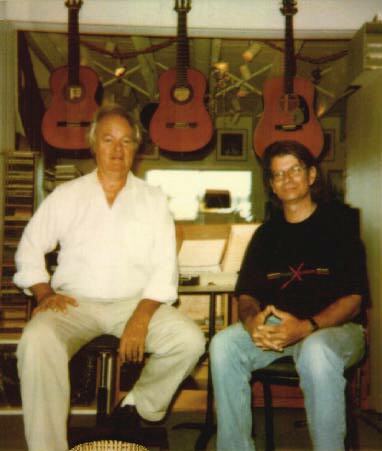 1994 - 2005 - Collaborations with composer and guitarist, Mason Williams (composer of the triple-Grammy winner, Classical Gas, 1968). 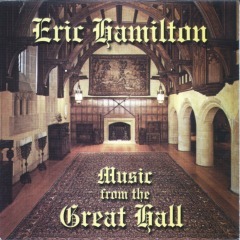 Four commercial CD releases: Classical Gas – the Music of Mason Williams (Warner Bros. music 2002), EP 2003 - Music for the Epicurean Harkener (Skookem records 2004), Eric Hamilton plays Mason Williams – Music for Guitar and Orchestra (erichamiltonmusic 2005) and Music from the Great Hall (erichamiltonmusic 1999). 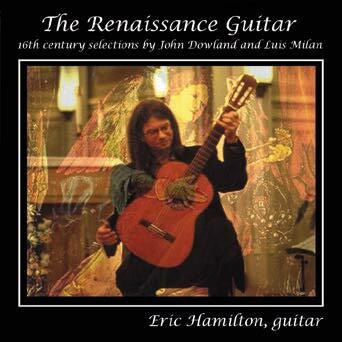 2006 - Solo guitar CD release, The Renaissance Guitar (erichamiltonmusic 2006) featuring the music of John Dowland and Luis Milan. 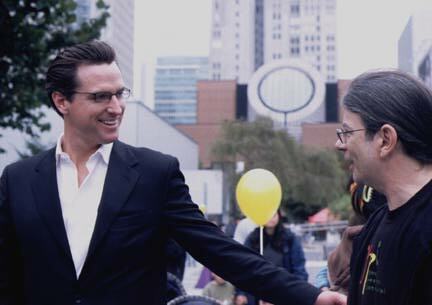 2005 - 2008 - Director of the San Francisco-based teen rock band ‘Free Lunch.. In 2006, ‘Free Lunch’ kicked off a major fundraising program, Free Lunch for African Kids. Their goal was to provide medical aid and supplies, school supplies, and food directly to two orphanages in Zambia (2006) and Uganda (2007). A month-long journey to Kenya and Uganda by several Free Lunch members took place in August, 2007. 2009 - chosen as one of the top 10 Bay Area music instructors by TeachStreet.com, http://www.teachstreet.com/. Attended classical guitar master classes given by Christopher Parkening at Montana State University (2000) and Roland Dyens, professor of guitar at the Conservatoire National Superieur de Musique de Paris (2005). 1991-2004 - Great Lakes region. A-Level warranty service technician for 22 major guitar manufacturers, service center for 17 school orchestra programs, 9 music stores, private clientele. Currently Eric is beginning his fifth year as a primary musical arts instructor at the K-8 charter school, COVA (Conservatory on Vocal/Instrumental Arts) in Oakland CA where he teaches classes in Rock Band 1 & 2, R&B band and intermediate guitar class. Eric Hamilton makes his home in San Francisco CA, performing and teaching throughout the Bay Area. In addition to his work in the music industry, Eric has acted as concert manager for the San Francisco Lyric Chorus and has worked as a restoration crew-member with world-class pipe organ curator, Edward Millington Stout, III. email: hamiltonmuse@gmail.com for more information. by John Dowland and Luis Milan. 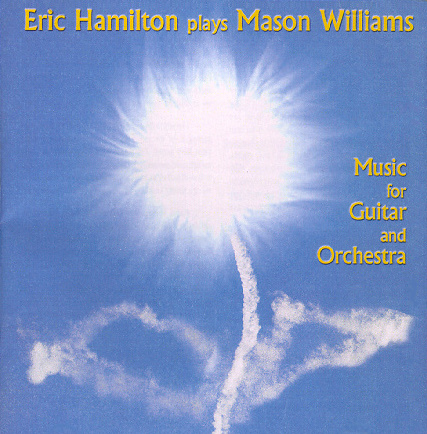 Eric Hamilton plays Mason Williams - Music for Guitar and Orchestra was released in 2005 and is the collective achievement of 74 musicians ranging in age from 15 to 80 years. "I knew I would play Classical Gas after hearing it for the first time...No matter how it's performed, everyone loves that tune!" "WOW and BRAVO...magnicificant, virtuosic, moving and musical playing." Tim Krol, Grammy winner and recording artist (13 albums) with "Chanticleer"
Music from the Great Hall, released in 1999, demonstrates a variety of musical tastes and textures ranging from classical to synthesized guitars with chamber orchestra. It features the music of Bach, Praetorius, Schubert, Mason Williams, Llobet and Ibert. To select other pages on this Website, use the Navigation Bar at the top of the page.